James aims to capture the expression that makes your pet unique, in beautiful colour detail. 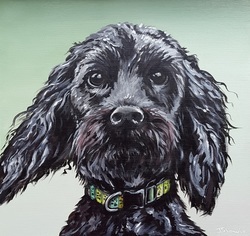 Commission a portrait of your much-loved animal for your home or to give as a gift. You will need to supply a good quality, high resolution photograph*, (or if necessary/practical, James will take a photo himself). Prices start from £125 for an original acrylic on board, head and shoulders on a plain background, sized approximately 30x30cm, and framed in a white open box frame. Due to amount of time involved for the artist, you will need to allow a minimum of four weeks for delivery/collection. ​*How to take a good quality pet photograph. Ensure that focus is good. Remember - the better the photo, the easier it is for James to capture the essence of what makes your pet so recognisable to you.